Most multinational enterprises (MNEs) pursue growth and aim to expand their international portfolios of operating locations. Often, however, they face important limits to growth. This dissertation studies several such limits and aims to restore balance in the international business literature by addressing some of the biases built over time. Firms’ home-country activities may act as a limiting factor in their international expansion trajectory, but have received little attention to date. One of the dissertation chapters reveals that a firm’s domestic footprint, in combination with domestic environmental uncertainties, shapes its cross-cultural expansion strategy, and may limit the complexity it adds to its portfolio. The subsequent chapter indicates that behavioral factors have an important bearing on international portfolio growth decisions, more so than hitherto assumed. It finds that the net growth of an MNE’s country portfolio in the face of cultural and economic diversity within that portfolio hinges on cues as to how well the MNE is performing relative to its own past performance and the current performance of its peers. The last chapter indicates that firms’ domestic activities not only shape their internationalization moves, the reverse also holds true. Emerging economy firms seem to benefit domestically from cross-border acquisitions only under certain circumstances, most notably when they are already characterized by a relative high degree of internationalization. 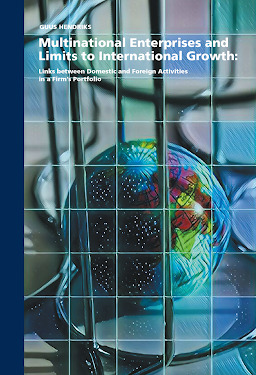 The chapters thus collectively study the linkages between a firm’s domestic and international activities and shed new light on the various limits that firms face in their international growth trajectories.